New and historic repurposed buildings and a thoughtfully designed landscape will allow for campers, farmers, researchers, and visitors of all ages to engage in hands-on learning about regenerative agriculture in an authentic, meaningful way. Your support makes this campaign possible. When you come the farm now, you can visit with the livestock in one of our barns, explore our small education garden, and walk along our campground roads. The new Farm Discovery Gardens will be a tremendous shift towards a more meaningful experience in a space that is specifically designed for visitors and learners. The gardens will be a dynamic landscape for learning, playing, and imagining in nature. Having a diverse mix of interactive elements, from a nearby teaching kitchen to a pollinator meadow and fungal forest, the gardens will give children enriching experiences at Wolfe’s Neck Center like never before. Our new education barn site on the site of a former barn (demolished in 2008) and the historic Little River House has been repurposed as the seasonal hub of our popular Summer Day Camp. Stop by to visit the livestock and see the new space! The Fall 2017 renovation of the historic Pote Barn on Wolfes Neck Road turned it from a dilapidated underused space, to the new home of our herd of heifers. Rebuilding the Pote Barn and converting an old manure storage facility to heifer barns was beneficial for our farm team and for the long term plan for our organic dairy operation. It also properly preserved its history. Renovation began in June 2017 with work by Houses and Barns by John Libby. The barn was dismantled through an extensive numbering system, each post and beam restored as needed, and rebuilt on its original footprint. An additional barn was built below by local contractor Mark Vaschon for use in the new heifer facility. This new barn will serve as the center for our residential farmer apprentice program and will house a dairy herd of 60. It will also include the milking parlor, maintenance and equipment shop, commodity storage, and a research station. Our Visitor Center will serve as the primary entry and information point for all campground and day visitors. An indoor market will feature the farm’s fresh produce, meat, and farm products. A café will offer a menu with food sourced locally and from the farm. 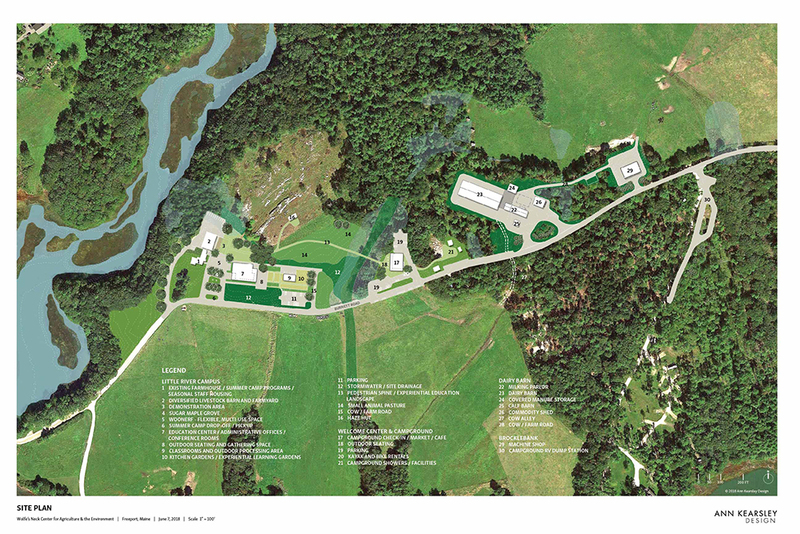 The Smith Center will be located at the main campus of the farm on the site of the existing dairy barn. The Center will have classrooms, a commercial teaching kitchen, indoor growing spaces, meeting rooms and administrative offices. The space will be used for year-round programming on nutrition, culinary education, soil health research and more. The farm’s natural landscape will always be our primary “classroom” but this innovative center will bring deeper, more diverse and meaningful experiences for people of all ages.